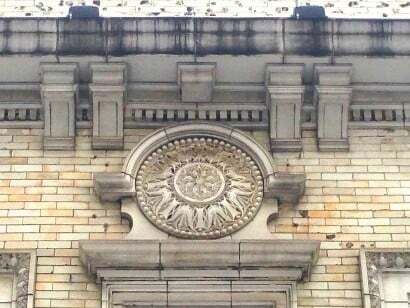 Everywhere you look in our great city there is evidence of extraordinary masonry craftsmanship from a bygone era…but sometimes you need to look closely to find it. This is a photo of the third floor of what at first appeared to me to be a rather nondescript commercial building located on the 4600 block of North Broadway in the Uptown neighborhood of Chicago. The moment I spotted this upper floor detail, I leapt out of the car and photographed the image. What a beauty! The full view of this brick, stone and terra cotta facade is obstructed by a multitude of elevated train tracks and a modern first-story commercial awning not in keeping with the period or elegance of the building. Next time you're passing an older part of town, look up and revel in our city's historical (and irreplaceable) building stock. For over 60 years, AAA-1 Masonry & Tuckpointing has lovingly restored brick, stone and terra cotta buildings of historical significance. If you've got a beauty like this one (or a diamond in the rough), give us a call. My buttons are bursting. Today I had the privilege of taking my 7-year-old daughter to work. This was a school sanctioned event, and parents were encouraged to take their child to work and show them how their day is spent providing for their families and contributing to a productive society. After our appointment, we went to visit one of the crews working on a beautiful six-story terra cotta building in Hyde Park on Chicago's south side. We arrived just as the men were taking their mid-morning break so we gathered everyone together for a group photo. The men resumed their grinding and tuckpointing and lintel replacement, and all of this activity really fascinated Charlotte…until she noticed an ant colony a few feet away and we went to explore that. From Hyde Park we drove to the bank to deposit the payroll for the week, and Charlotte made her first deposit to the passbook savings account I opened up for her shortly after her birth. Responsible money management is an important part of running a business, and we discussed the advantages of depositing her future weekly allowance money in an FDIC-insured bank versus keeping it in her bunny bank at home. From the bank we drove to the office where I drafted customer proposals, and Charlotte worked on coloring activities and a word search with important words from our trade (e.g., trowel, lintel, mortar, parapet wall, scaffolding) all provided by the office managers Carolina and Norma who have known Charlotte since her birth. Admittedly, very few of my scheduled tasks were completed today due to Charlotte's boundless energy and unending questions but it was, without a doubt, one of the most gratifying days at work — and this is coming from a guy who loves what he does for a living. I encourage everyone reading this blog to consider bringing your child or grandchild or niece or godson with you to your place of work to show them what you do and the pride with which you do it. It may not seem like a big deal, but the experience for both of you will be unforgettable, will make after-work conversations with your little one more interesting, and will offer your child an opportunity to glean a greater contextual understanding of how our world works. Just when I thought the extreme winter weather was going to do us in once and for all, Carolina (our fearless office manager), received this in today's mail. 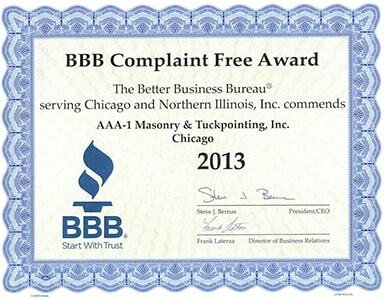 Receiving the Better Business Bureau's 2013 Complaint-Free Award is a real honor, allows us to maintain our A+ rating with this venerable institution, and serves as an important reminder that commitment to the craft and customer service do pay off. A heartfelt thanks to all of you homeowners, Association Board members, property managers and real estate professionals and inspectors who have supported us through the year. Your loyalty is recognized and greatly appreciated! Despite the very cold weather this winter, the phones have been ringing steadily with landlords, property managers and homeowners desperate to stop the leaks coming through their exterior walls and into their living spaces. Due to our region's Polar Vortex, it seems that many buildings' gutters and downspouts are frozen solid with ice. Even though the air temperature at high noon isn't even breaking zero, ice on the south sides of many buildings is melting a bit in direct sunlight and that runoff is causing leaks inside the units. Because it is much too cold to make masonry repairs (when nighttime temperatures dip below freezing the mortar fails to cure properly), we have been installing a lot of heavy-duty vinyl tarps to masonry walls as a means of providing a physical barrier from the elements. The solution is 100% effective if the ice and snow in the affected area is first slowly melted with a blowtorch (perfectly safe for masonry walls) prior to tarp installation. What's neat about our tarps is their durability. If you don't mind having a tarp installed on the exterior of your building, our tarps may be left up indefinitely (i.e., many years) because they do not shred, rip or tear like the cheap tarps you may find in the big box stores. Once the tarp is installed, wind-driven snow and sleet are thwarted and water is no longer able to infiltrate the wall, allowing you to make the required repairs to the inside of your living space. If you think your building would benefit from the installation of our heavy-duty vinyl tarps and secure fastening systems, please don't hesitate to give us a call 847/491-9700 (suburbs), 773/622-7300 (city), or e-mail us at Info@AAA1Masonry.com. During this time of extreme weather, we ask that you look out for your neighbors and travel with caution. To date it has been a brutal winter in Chicago. This year, the arctic cold came almost a week before Thanksgiving and has not let up since. I remember the blizzard of 1979 quite clearly, but until this year I had never heard the term "Polar Vortex" nor heard a weatherman report windchills of 50 below zero. As one of my foremen reminded me recently, 2013 was the shortest work season we've experienced due to inclement weather in the past 32 years (and he would know since he's been working with AAA-1 Masonry since then). Record-breaking spring rains and unending record-breaking cold starting in mid-November have made 2013 a season we are glad to put behind us. Only a few days remaining in January and the historically cold winter shows no signs of letting up. And yet this week, as I drove the streets of Chicago, the North Shore and Oak Park clearing ice from customers' gutters and performing masonry inspections for 2014 spring work, I saw masons performing restoration work all over the place. In Oak Park, I saw brickwork being performed along the busy commercial stretch of Oak Park Avenue. In Chicago's Wicker Park, new construction projects along Damen Avenue were humming along. I was aghast. Why? Because masonry work uses water—and lots of it—to make the mortar we use. (For the uninitiated, mortar is the very important glue which bonds together brick, stone, concrete block and terra cotta.) If the mortar freezes while it is curing—and it can take upwards of 4 weeks in cooler weather for mortar to cure completely—its strength, longevity and resistance to wind-driven rain can be compromised... sometimes significantly. 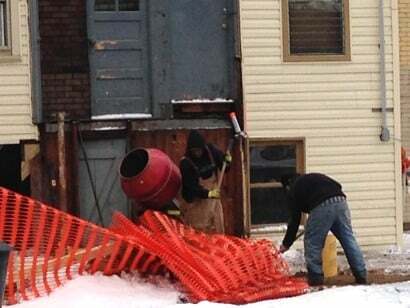 If you think you can cheat Mother Nature by adding accelerants or "season extenders" (which reduce the freezing point of the mortar mix for cold weather use), think again. These additives seriously compromise the quality and longevity of the mortar, and often lead to additional maintenance costs—costs which could be avoided completely if the mason were to respect the temperature restrictions of the mortar. If you hear a supposed mason telling you that it is okay to use mortar additives because everyone does it, you need to consider removing him from your project. The actual point at which new mortar will freeze depends on a lot of factors, but a failsafe rule of thumb is this: If nighttime temperatures are going to dip more than a couple of degrees below freezing, then the weather is going to have a deleterious effect on your mortar (or on your concrete if you are pouring a foundation). And the colder it gets at night, the worse the impact. I suppose that if you're a developer building a new residence and offer only a one-year warranty from date of completion on your work, you'll probably avoid a lawsuit from the new owners when, a few years down the road, the mortar begins to fail and the entire structure needs to be ground out, tuckpointed and sealed at a terrific cost. But if you're a mason with even a shred integrity, you know better and will not work with mortar when nighttime temperatures are going to drop more than a degree or two below freezing. Here are two eager workers getting ready to pour concrete footers for a front porch in the Bowmanville neighborhood of Chicago. (You can see the red cement mixer in the center of the photo and the round yellow sonotube sticking out of the ground just behind the worker on the right.) The temperature was in the upper teens in the middle of the day when this photo was taken, and the evening forecast called for sub-zero temperatures (before accounting for windchill) and 2" - 4" inches of snow. Concrete and mortar require many days to cure properly, and if it freezes during this period it is as good as useless. Would you pay for this work? The second-story concrete blocks used to build this masonry structure in East Lake View are frozen solid. (The dark patches are frozen water.) The home builders failed to wrap or heat the site. The daytime temperature was 12 degrees when this photo was taken; I wonder how much colder it got at night?! But don't worry about the structurally compromised concrete block walls... you won't be able to see them after the builder throws the facade up over it! 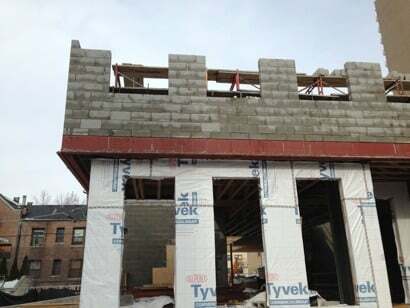 Masonry work is being performed all over Chicago in these inappropriate weather conditions (it is unethical—but not illegal—to build in the dead of winter). The result is poorly constructed housing stock unable to withstand wind-driven rain and in need of increased and more costly maintenance.